Students between 7 and 12 years of age may participate in our youth program. Read about Our Certified Instructors. There is no competition in aikido, and rather than encouraging aggressive and competitive behaviors, aikido at Jikishinkan fosters community, social well-being, and cooperation. Progress is measured individually, not in relation to others or victory over others, and one’s greatest obstacle to success is oneself. At Jikishinkan, we also practice formal martial arts etiquette, such as bowing to teachers and partners, and specific styles of sitting, standing, asking questions, and starting and ending class. The etiquette infuses a class with politeness and civility, a skill and way of life that students learn to practice inside and outside the dojo. 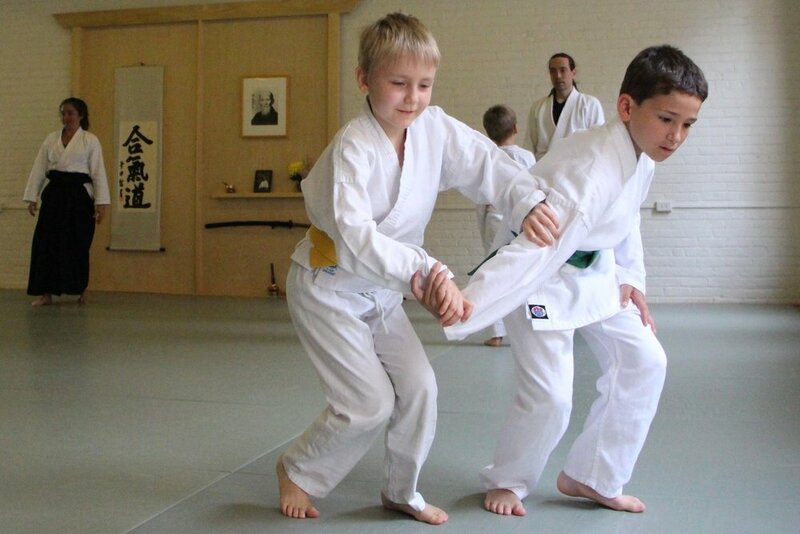 Aikido is a unique and inclusive approach to improving the minds and bodies of children and young adults. It is accessible to all ages, genders, races, and ethnicities. It requires no specialized equipment, and can be performed by anybody regardless of height, weight, and strength. Aikido provides the physicality and fitness of a sport but the finesse, contemplativeness, and creativity of studying and practicing the arts. Classes at Jikishinkan combine serious technique practice, fun activities, and exercise. To learn more, visit our dojo and watch a class or contact us.